Toca Madera Winery is having music! Folklore Society musicians will be performing at this attractive winery, which is about five years old. It is located about three miles west of Valley Children’s Hospital, on Avenue 9. 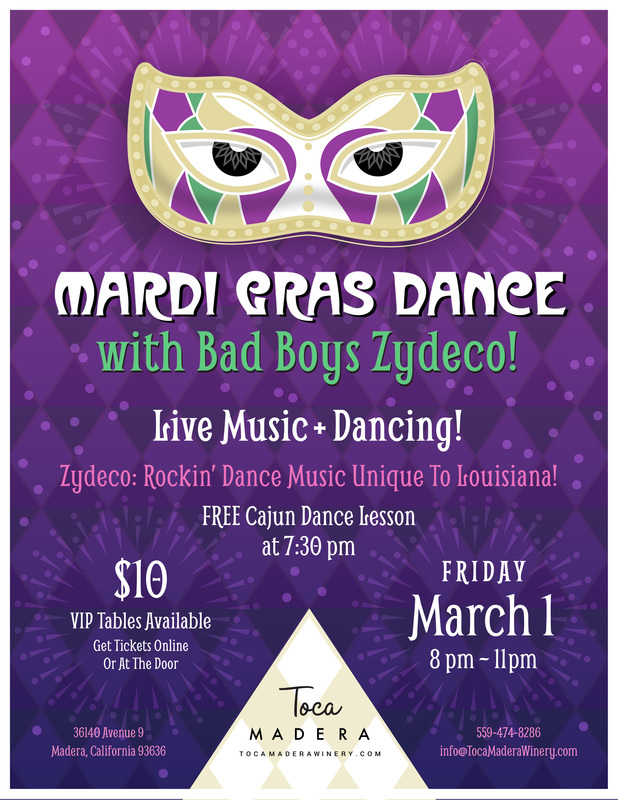 It all starts with a Mardi Gras zydeco dance/concert on Friday March 1st, 8-11 PM, when Bad Boys Zydeco will play their usual blend of Cajun, zydeco and blues music. The band will feature Franck Goldwasser on guitar, Chris Millar on drums, Kevin Hill on bass, John Shafer on scrubboard and yours truly on accordions. Doors open at 7 PM. Shake what you got to the rhythms, and if you wish, take advantage of the free Cajun dance lesson at 7:30. Bring your friends and if you don’t dance, you can sit, listen, and enjoy the fine wines, taco truck specialties. VIP tables will also be available. Tickets are $10 for the event.